Nearly half of Irish voters say the government has done the right thing by appealing the European Commission’s ruling instructing the iPhone maker to repay $18.9billion CAD in back taxes to Ireland, reports the Irish Times. The Irish Times/Ipsos MRBI poll results released today reveals that Irish voters support the government in its decision. 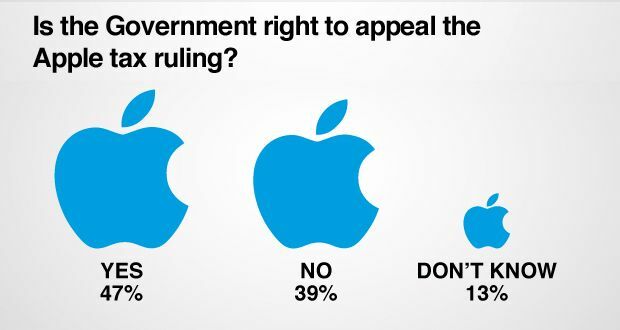 When asked whether the government was right to appeal the ruling, 47% answered with yes, 39% said no, and 14% had no opinion. The strongest supporters of the appeal are Fine Gael supporters, the poll reveals, with 61% of them favouring the Government’s decision. Gael is seconded by Fianna Fáil supporters, and Labour voters seem to close the circle. Against the appeal are Sinn Féin voters and supporters of the Independents and smaller parties. After the ruling was released, Apple’s Tim Cook reacted immediately with an open letter outlining the potential harmful effects of the ruling and said it will seek justice in court. He also called the Irish government to appeal the ruling, and, after heavy debates behind closed doors, the Irish government ultimately decided to take that step.